Team Alberta will be trying to go for basketball gold later this month, with a local Taber product helping that cause in the middle. 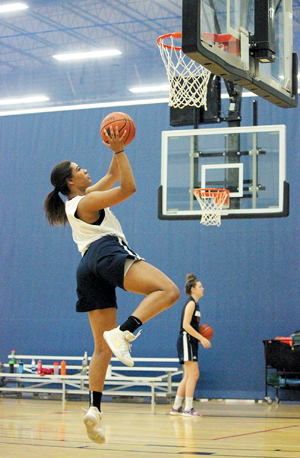 Kitawna Sparks made the cut for the Team Alberta 17U Girls Team among roughly 50 players that tried out. Having past provincial experience with the 15U team, Team Alberta will be making its way to the national championships which are in Fredericton, New Brunswick and run Aug. 5-12. As a multi-talented forward, Waknuk noted Sparks will bring high energy to both ends of the floor, along with scoring, rebounding and defending down low. Every single province and territory will be represented at nationals, with Team Alberta initially going in as the No. 4 seed. The team has been practising together in Edmonton and Lethbridge for the month of July. “The rankings are based off of last year. Essentially, the first few games will be for seating later and you will be playing for medals by the end of the week. Hopefully, we will be playing for a medal,” said Waknuk. There will also be 15U girls nationals being played in Fredericton as well.